Q: Could I cover a dirtbag house with traditional cement rendering or would it be too heavy - or too difficult for an amateur to apply? A: I know of several bag domes that are covered with ordinary cement stucco. Q: I am building a garden wall as well as a long retaining wall with the hyperadobe technique. The garden wall should have plaster on both sides, the retaining wall of course only on one side (facing south). Could you please advise me on the best suited mixture for the plaster ? A: I would use a standard stucco mix, which is 1 part Portland cement, 1 part lime, 3 parts sand. Q: Could I simply spray stucco over my earthbags when finished laying them? Any idea where to get a stucco sprayer on a budget? A: Yes you can use stucco as a plaster over earthbags, and this could be sprayed. Probably it would be best to use a stucco netting to help keep the plaster from cracking too much and keep it attached to the bags. Depending on the location of the bag surface, you might want to have a moisture barrier over the bags before the stucco netting it placed to help keep moisture from getting through any cracks that do appear. For instance this might be more important with a dome than with a protected wall. Stucco spraying equipment can probably be rented...or you might just want to hire an experienced crew with their own equipment. Q: There is a lot of rice grown in Texas, so I am thinking that filling the bags with rice hulls would work best. However, I'm not sure what type of plastering material to use over the earthbags. Papercrete doesn't seem to be the right material, since it is usually quite humid here. Can you suggest the best material for me to use? A: I think that the choice of plaster could be critical to the success of this project. Rice Hulls are bound to compress quite a bit with pressure from above, so a weak plaster might fail over time. For this reason, I would recommend an ordinary cement stucco that is well reinforced with mesh. If this were done both inside and out, then you would in effect be creating a large SIP (structural insulated panel), with the rice hull bags as the insulating filler and the stucco as the exterior membrane. 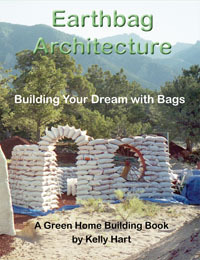 It has been shown that with strawbale walls, the plaster is often the load-bearing part. You might construct a small wall in this fashion to convince yourself and the authorities that it can withstand the necessary pressure of a roof structure, etc. Q: If I plaster with cement stucco, is chicken-wire mesh necessary? Is there a less expensive option? A: You can plaster without the mesh, but the stucco will be more durable over time with it. I believe that there are several other stucco mesh options, but I don't know the costs. A: (Owen Geiger): Poly (synthetic) fish net is less expensive than conventional wire plaster mesh. It's been used with earthbags with good success. If you look around you'll find some that are incredibly inexpensive. Must be made in China or somewhere similar with low cost production. And they're very strong. You can use twine to tie it to the bags. Q: Just how thick is a cement plaster layer used on earthbag? And does it take a lot of cement to fill in the uneven face of the bags? What is the minimum thickness? For me to propose this material to the regular building people I need more specific info. A: Earthbags do need to be covered with a plaster, or be protected somehow from the sun, but this does not have to necessary be with cement. Because of the cavities between bags there is some natural variation in the thickness of any plaster, but I would say a minimum of about an inch would be appropriate. Q: What's the best way to finish the bags for a humid environment? We like the smooth plastered look. A: Probably an ordinary cement stucco is the most durable, especially in your climate. Q: At one point on your site you suggest using Portland cement mixed with lime. Would that be a good bet, and if so, where can I find instructions as to proportions? How about a mix of P. cement, lime, and some of my clay-ey dirt that I soften up with water? A: Portland cement, lime and sand is a conventional mix for masonry mortar, mixed 2:1:9...and I am sure this would make a very durable and sticky plaster. I wouldn't add clay to this, since clay and Portland cement are somewhat at odds with each other. Q: I have an acre of land in the Seattle area. It is rural forest and my private road is an old dirt logging road. I have excavated part of a hill next to the road and it is about 10' high. I want to put a raised bed/retaining wall there. Serving the purpose of reinforcing the dirt wall and providing seating next to the road and a planter bed. I wonder if you have any ideas for plaster for a retaining wall that gets rained on frequently and on the earth side obviously has earth packed against it? A: If it were me, I would probably opt for a cement-based stucco plaster over the exposed bags, mainly because the wall will be completely exposed to the weather and this will require the least maintenance over time. Stabilized earthen plasters or lime plasters are other options. Use of a stucco mesh will further stabilize the plaster. Retaining walls of this sort do need to deal with the possible build-up of water behind them, so a French drain around the base and/or periodic weep holes in the wall might be a good idea. Q: What is the best plastering material for moisture and wind? A: The most durable plaster under severe weather conditions would also be cement-based stucco with a mesh material embedded in it. If the cement ratio is high enough, it would be virtually waterproof. Q: I live in rural north Portugal which can have torrential rain-storms. Would you recommend any special outside render-covering of the earthbag structure for this particular situation? A: The ideal render for waterproofing an earthbag dome is still a matter of speculation. The conventional approach seems to be the use of cement-stabilized stucco, which can be enhanced with latex. If this is inadequate then it can be painted with various exterior roofing paints. Structures that have conventional roofs with eaves are much more forgiving, and stabilized earthen plasters or lime renders will work fine. Q: One thing that startled me was the story of the domes that were built in Philippines for the health clinic. They used a layer of mud plastering prior to plastering over it with the cement plaster, and it obviously failed. My understanding was that the failure occurred because the cement does not adhere well to that type of earth plaster. The plaster must have cracked off in a number of places, and then the exposed earthen plaster (which probably had seeds in it) came to life (plants grew out of it). A: Yes, the outer layer of fill and plaster did fail on that Clinic, probably for several reasons. Cement-based stucco is very hard to keep from cracking some, and all it takes is a few little cracks to let moisture in. Then once it has penetrated it cannot easily escape, so moisture accumulates to germinates seeds and cause other problems. For this same reason it is generally not advisable to stucco over adobe walls. Lime plasters are much more breathable than cement-based ones, so this problem is less likely to occur. But in a rainy climate lime plasters may not provide enough moisture protection on domes. This is the perennial problem with earthbag domes: How to seal them from moisture? CalEarth is still trying to come up with a solution to this. Last I heard they were going to try Elastomeric paint on the domes they plan to build in Haiti. In Mexico, I basically did the same thing, using a commercial latex-based roof sealer to paint the cement stuccoed dome that I built with students at a school recently. A: You might take a look at what was done with this seating project.They utilized a cement-based stucco over wire mesh with a lime wash finish. This is probably about as durable a plaster as you could use, and would likely require periodic (perhaps every other year) renewal of the lime wash to keep it looking good. The protected earthbags will basically last forever, as far as I know. Q: I have built a 40m2 earthbag building by a builder and he did 1st coat rendering using; 2 Lime:5 River sand:5 Volcanic Sand (deco sand):1/2 Cement: Straw. Under the situation I need to do 2nd & 3rd coat rendering and I would like to ask you if you could give me some advice for the mix. I had some tests using our red soil/lime/sand/clay which is bit different ingredient than 1st coat. Would that be possible to use different mixes for 2nd coat? What about 3rd coat? A: I would expect that the first coat would make a good base for most any mix for the subsequent coats, especially if it is sufficiently rough to hold onto the new coats. Usually plasters involve a first rough coat, then a float coat final coat, which is smoother and has any final colorant added. For the exterior it is a good idea to stabilize it with cement, lime, or both. I suggest running some test patches to see what works for you. Q: Would it be possible to add some colour to the Standard stucco mix you recommended? So that the final colour would not be Grey but Brown or dark Brown? If yes - which Kind of colour? A: Yes, there are a wide range of colorants available for stucco. Inquiry at a local outlet for stucco supplies, or ask a local stucco contractor. Q: Can one apply concrete stucco immediately after the walls have been completed or is it recommended to wait before apply the stucco?Â If it is recommended to wait how long is it recommended? A:Â It is important to keep sunlight off the bags as much as possible, but then you also want the material in the bags to dry out if it was dampened prior to filling. Stucco doesn't breathe very well, so my suggestion would be to stucco the exterior as soon as possible to protect the bags, but then leave the interior free of plaster until you are sure that the material in the bags is dry. Q: We built 3 terrace walls out of sandbags filled with our native (very sandy) soil this weekend. Today my husband applied a mix of 1 portland cement, 1 lime, 3 sand (half purchased sand, half native earth). It is cracking all over the place. Especially on the top surface of the walls. It's a very windy day here. A: Cement based stucco will often crack over time, and the use of a stucco mesh attached to the wall can help keep it intact on the wall. Also, it is important to keep the stucco damp for a day or two because too rapid drying will weaken it. The combination of sun and wind will tend to dry things out too quickly. The mix that you outlined is a standard stucco mix, so that shouldn't be a problem. It is unclear to me why you are having this problem. Sometimes cement or lime that has been sitting around for too long produces weak plaster. Once the stucco has dried like that there is not much that can be done to fix it other than reapplying stucco over it as you suggest. If you do this you should thoroughly dampen the existing plaster before applying the next coat, and then keep the new plaster damp for couple of days. You could even throw a tarp over it where practical.